Home » Air Transport » INSIGHT: Russian air transport on a flight path to stability? Over 100 million passengers, a vigorous recovery in passenger demand, the bankruptcy of VIM Airlines, and S7 Airlines’ re-launched “home” hub at Novosibirsk – a summary of the 2017 Russian commercial aviation performance. Russia’s airlines finally managed to pass the 100 million passengers milestone last year, collectively achieving a total of 105 m. But is this an impressive success story, or not? It seems the answer to that question much depends on one’s frame of reference. If compared to 1998, for example, when the registered passenger traffic of all Russian airlines combined was a little over 20 million, then it certainly appears to be a substantial improvement. In reality, however, how can we compare a four-fold growth in 20 years when contrasted with a single European low-cost carrier, such as the largest one, Ryanair, and its 129 million passengers? Suddenly, the Russian figure appears rather modest. Is this milestone important? It seems so, at least for the Russian government officials, as they celebrate the news as if they have carried the entire 105 million passengers personally on their shoulders. There are people out there who brag that 30-year-old industry records have been broken, even though enough time has elapsed for a new generation to be born who barely remember the USSR with its one and only air carrier, or the huge queues at ticket offices, and other forgotten attributes of the bygone era. In reality, the nice round number is just a solitary statistical checkpoint among many that, hopefully, will be superseded on many occasions in the future. What is more significant perhaps is that the current passenger traffic totals of Russian airlines have, for the first time, exceeded the numbers of long-distance rail travelers. Statistically, the traffic on long-distance trains has dropped by 14 million passengers since 2012 while, at the same time, the number of air travelers has increased by 31 million. This proves that traveling by aircraft is no longer perceived as an expensive option. In Russia it has increasingly become a part of everyday life and hopefully will stay as such. And although no-one truly knows the precise number of people traveling by air – bearing in mind the statistical data reflects passenger-segments only (for example, one person traveling from Chelyabinsk to Sochi via Moscow on a round- rip adds four passenger numbers to the statistics) – one development is for sure: passenger traffic is going up. This certainly is the way to build customer loyalty, not just airline-wise, but generally toward the choice of transport mode. Once accustomed to getting from Moscow to Sochi in just a couple of hours, will people relish spending 24 hours on a train for the same trip? And even the dubious comfort of 28 inches of seat pitch and baggage fees (and sometimes hand luggage fees too) may not appear to be so relevant when compared to the time saved and the emotional advantages derived from air travel. Currently, a Russian resident travels by air less than once a year on average. By contrast, Turkey, with half the population and a territory some 22 times smaller, is outpacing Russia in terms of passenger traffic on domestic flights. Clearly Russian commercial aviation remains far from being mature, and so we are to expect drastic changes in the years to come. Milestones and records are not the only key drivers of business. Air transport is no longer an industry that can generate fabulous profits. Instead, airlines have learned how to guarantee relatively stable revenues despite tough competition, unpredictability, highly volatile oil prices (and, consequently, the price of jet fuel, which is often the main cost item), and crucial reliance on macroeconomic, political, and other types of disruptive crises. According to airline association IATA, the industry has been registering net profits globally for eight years in a row – a shocking contrast to the Russian air transport sector, which ended only 2010 and 2016 in the black. In 2017, commercial aviation and the Russian national economy once again existed in two parallel universes (or rather in perpendicular ones, see Chart 1). As the Russian State Statistics Service reveals, the GDP growth constituted less than 2% (tentatively), the nominal pay-scales grew by 7%, yet the real pay (inflation included) almost stagnated. Judging by the world statistical trends, under macroeconomic conditions like that, the growth in demand for passenger air services would barely exceed a few percentage points. But, surprisingly, this turned out to be 20%. Is it a paradox? Yes and no. First, the demand for travel and vacations – deferred during the period of the recent economic crisis – finally sprang into action. As soon as the GDP dynamics turned slightly positive in Q4 2016, the demand for airline services revived (+12.5%, against -8.3% in Q3 2016) and that trend continued in 2017. In 2010, when the country was recovering from the previous crisis, Russia witnessed the same bleak picture, though on a larger scale. The government’s decision to lift the ban on charter operations to Turkey was also a significant contribution to last year’s performance. Second, one should bear in mind Russian households’ undeclared “grey” incomes, which are not reflected in official statistics. According to the latest IMF report, the country’s black-market economy comprises as much as one third of the national GDP. Even the State Statistics Service estimates this “grey” share of personal income at 10 trillion rubles ($174 billion) annually. But we see no surprise here when the growing shadow economy reveals itself in the accelerated growth in demand for air travel. We have been witnessing for several years now that the connection between passenger traffic and macroeconomic indicators is far removed from logic and reason. This is possibly attributable to the fact that people spend some of this off-the-books income on vacations and travel. Third, in 2017, Russian airlines went back to their usual losses and lowered fares in an attempt to positively invigorate the market. Fortunately, the subsequent price wars did not become as severe as those in the 2012-14 period. Instead came the new specter of excess capacity and its effect on the market, a subject which will be discussed further on. It appears that the rate of consumer demand growth is likely to stay within 6% to 7% in 2018, assuming there are no significant macroeconomic changes and the current exchange rate of the Russian ruble remains the same. At the same time, the much anticipated resumption of air services to Egypt will contribute considerably to fostering further growth in passenger numbers, although some part of this traffic will simply migrate from other international and domestic holiday destinations. In this case, even if the new traffic growth exceeds 10%, the industry (with some carriers excluded) will still almost certainly continue to suffer losses this year too. In 2017, Russian airlines collectively set a new fleet record by adding a total of 140 factory-fresh and pre-owned aircraft to the roster. According to Air Transport Observer and Russian Aviation Insider’s own calculations, the available capacity growth thus created added 12% (see Chart 2) to the total figure. The industry registered a robust fleet expansion for the second year in a row (in 2016, the fleet size had increased by 10%) after the market correction in 2015. One year ago Air Transport Observer predicted that nothing good would come out of reckless increases in available capacities, foretelling the risk of inevitable bankruptcies amid the intense growth in competition. It turned out that we were right. National carrier Aeroflot, the dominant market player, was responsible for 50.2% of the total revenue passenger kilometers (RPKs) flown by Russian airlines in 2017. Its share in the net capacity increase (after the deduction of phased-out aircraft) comprised about 40%. Aeroflot’s three key competitors combined – S7 Airlines, Ural Airlines, and UTair Aviation – enjoyed 23% of total RPKs in 2017. However, their joint share in the aircraft capacity increase constituted only 12%, a factor which indicates that these air carriers opted for more prudent tactics. Right behind Aeroflot, with 21% of the total capacity increase, was iFly Airlines, an affiliate of one of the biggest tour operators which decided to try its hand as an individual player in scheduled flight operations. Number three on the list (12%) was Red Wings, another charter carrier with a very peculiar market niche. Some 6% more of the net capacity increase was taken up by VIM Airlines, a comparatively small company (with a market share of less than 1%) which was primarily involved in scheduled operations. It is worth remembering that the ambitious rise of VIM Airlines in 2016 and H1 2017 faded miserably as soon as the seasonal downturn of passenger traffic began. In 2016, the carrier provided 17% of the net capacity gain (number two after Aeroflot Group), which logically raised concerns about its ability to efficiently manage the rapid growth. The operator did not make it, and filed for bankruptcy at the end of 2017. There are many expert opinions as to why this happened. Some point out that the airline’s owners had no choice but to go all-in; others say it took VIM Airlines too long to ramp up the transit numbers of Chinese tourists the carrier was betting on with its widebody fleet. Finally, some believe it all happened after a change of management at one of the airline’s banks and the subsequent discontinuation of a line of credit, which triggered an avalanche of unsolvable problems. One way or another, a rapid fleet expansion against unstable revenues and an unclear, undeveloped market niche has always been a huge risk that often ends with airlines biting the dust. 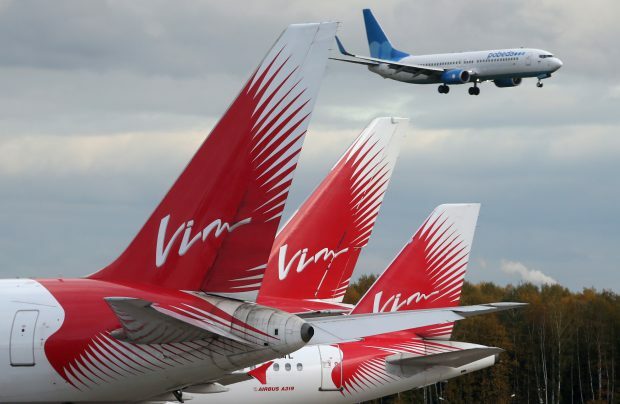 The sad, but predictable, collapse of VIM Airlines came as a complete surprise to the Russian aviation authorities, which allegedly had been scrutinizing the carrier’s financial status on a regular basis. As a follow-up to the saga, the government is now carrying out a much more rigorous monitoring of airlines’ financial and economic standing. Nevertheless, Alexander Yurchik, Russia’s newly-appointed deputy transport minister, is sticking to a well-thought-out position. In his opinion, the market economy witnessed financial failures in the past, has them in the present, and will suffer again well into the future. So, Yurchik argues, the market share of less efficient companies becomes re-distributed among the more stable players, and it is none of the government’s business to interfere in the process. Rather, what the government should do is look out for the passengers’ interests and not let them suffer too much. The authorities are also considering the creation of a stabilization fund, the deputy minister says, although it would not mean that the more stable companies pay for the losses of those falling from the market, he adds. In our point of view, a broader understanding of capacity discipline and further export of air transport services (but not just within Aeroflot Group) are the key elements of bringing sustainability to the industry. There are not so many markets in the world where the available seat capacity can potentially grow by 10-12% in one year and drop by 15-17% the next. Such seesaw conditions will hardly guarantee the industry any long-term profitability or stability. The major market players are currently demonstrating a more considered, rational approach than they were, say, a year ago, when massive price and capacity wars were raging. From time to time some second- and third-tier airlines may still do some reckless things and provoke resultant industry crises – and attract some hasty reactions from government officials trying to clean up the mess. At the same time, the modern history of the Russian market vividly demonstrates that airlines struggling to survive should not naively hope for a miracle, or wait and see, hoping that the thing will eventually work itself out in some slapdash way. On the contrary, the obvious success of individual players which have been meticulously building a well-balanced destination network through the years, as well as winning customer loyalty and carefully managing their capacities, might be the way to go. One of the most interesting and positive innovations of the last year has been S7 Airlines’ large-scale project to re-launch its original hub at Novosibirsk’s Tolmachevo airport. By utilizing a combination fleet of regional airliners (78-seat Embraer E170s) and medium-haul aircraft (Airbus A320s and Boeing 737-800s in the 158- and 176-seat layouts respectively), the carrier managed to carve out a number of efficient passenger connections between European Russia, the country’s Far East, Western Siberia, and Kazakhstan. The arrival of new-generation Airbus A320neos (together with A321neos, which are to be delivered this year) opens up a fresh window of opportunities to develop even further the long-haul network reach from Novosibirsk. There are a string of reasons for Novosibirsk to blossom into a fully-fledged hub, in particular its location at the center of Russia and, after Transaero vanished from the market in late 2015, followed by VIM Airlines in 2017, the obvious resultant lack of available capacity on flights to Russia’s Far East. Apart from that, the Moscow air hub system has become too congested to allow for any extensive growth without a significant dip in profitability. On the contrary, coming back to Siberia and occupying some lowly competitive, though highly marginal, transfer markets was a smart strategic move to make. As a result, the number of transfer passengers using Tolmachevo mushroomed by an impressive 60% in 2017, while its share in S7’s own traffic on flights to and from Novosibirsk reached 20% (according to Russian Aviation Insider estimates). 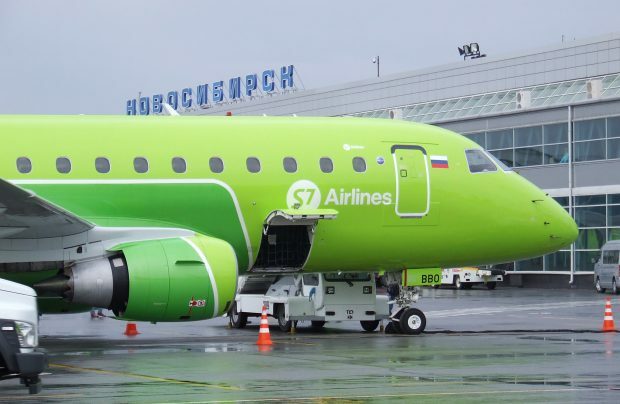 Thus far, even though it is not yet at the level of a true hub, S7 Airlines will this year continue to extensively grow Tolmachevo’s capacities and its destination network from Novosibirsk. The increased number of available seats in 2018’s upcoming summer schedule promises to inject a 60% year-on-year improvement on 2016, while the number of flights will almost double to 47, against 24 in 2016 on average. Meanwhile, the inability of the existing Tolmachevo infrastructure to fully stand up to the expected rapid increase in passenger numbers might become a constraining factor. The domestic terminal was rebuilt in 2009, and its lounges often become overcrowded during rush hours (the westward wave in the morning and the eastward peak around midnight). Another question is whether the economics of smaller regional aircraft operations will be able to compete with non-stop long-haul flights emanating from the Moscow air hub (including those carried out on widebodied airplanes), even with significantly shorter legs. Should the Novosibirsk business continue to grow as expected, as well as that at other comparable Russian airport hubs (like Ural Airlines’ Yekaterinburg, for example), these scenarios may well redefine and shift the existing flow patterns of passenger air travel from its current excessive focus on Moscow, thereby creating a new impetus for further growth of Russian commercial aviation.